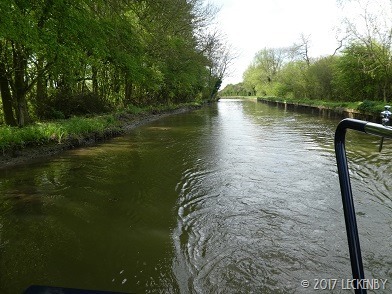 We moved off as early as we could this morning after realising that we’d inadvertently moored in a winding hole last night. Across to the services where we disposed of rubbish, yellow water, and topped up the water tank. A boat across the way asked if they should wait for us to do the locks, but we hadn’t had our breakfast yet so they headed off ahead of us. 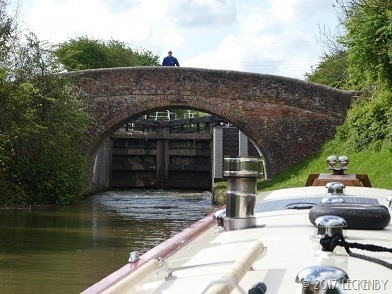 At 10 am we moved off towards the locks, the last twelve broad locks before Foxton. When we arrived at Bumblebee Lock it looked like someone was emptying it. We were nearly right, it turned out to be a C&RT chap running water down to make up for there being a very low pound a mile down the cut. He suggested putting the kettle on, we’d only just finished a cuppa. After half an hour of sitting in the sunshine we were allowed up. 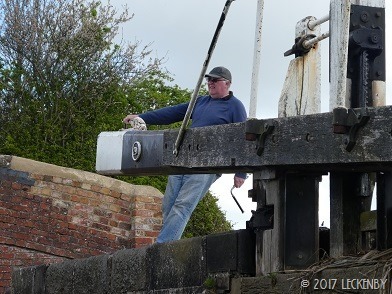 Some of the locks today were spaced closer together, close enough to walk between, others I had to stop and pick up the crew. We passed only one boat heading down today. They knew of low water levels ahead of them and warned us of the same behind them. The beams on a lot of the locks were as someone once said to me “finely balanced” or just bloomin’ annoying! Boat comes in, gate closed behind, other gate swings open. Stop whilst walking round to crack open a paddle to hold gates closed with a small stream of water, meanwhile the first gate opens itself. If you haven’t got the flow right the second gate will also reopen itself as you reach gate one. Argghhhh!!! 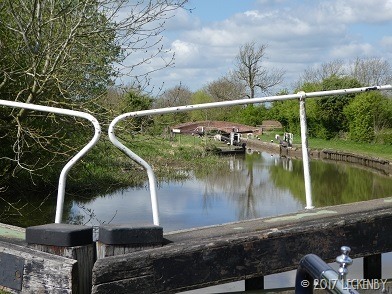 One of my favourite locks on a sunny day is Top Half Mile Lock. 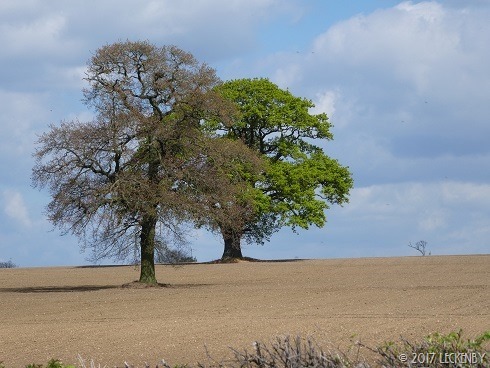 The tree next to it just makes you want to take photos. I have several going down hill and today I took plenty going up, it’s just as photogenic either way. 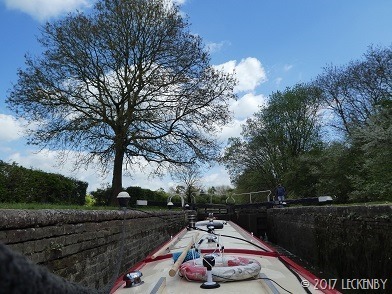 In broad locks we pass a rope up to be passed around a bollard and then back down to the helm. At the moment we are using Lillian’s two centre lines, one longer than the other. Where our plank and pole rest are located, which was our choice, the port side rope constantly gets hooked round the forward rest. Hopefully this will sort itself when we have two short centre ropes one on each side which we will keep in the fairleads, so away from the rest, fingers crossed. 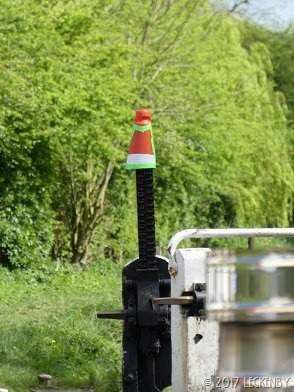 As we finished in Newton Top Lock the Lockie appeared and popped a mini road cone on top of the ground paddle. Any boat arriving would have to wait for them to finish running water down before they could proceed. Rounding the bend after High Bridge we saw that there was space for us over looking the pastures towards Wistow. This is a lovely mooring and if we weren’t on a mission I suspect we’d have stayed for the night, instead we paused for lunch drinking in the view. After Cranes Lock we were met with a very low pound, the next lock was a bit of a way so Mick hopped on board hoping that we’d be able to get into the side to drop him off. This was ditch crawling, we have known worse when we came across a drained pound in Wigan in 2014, seriously slow progress. Mick hopped off where the canal narrowed and I continued to crawl to the lock which was full. Holding back whilst it was emptied, except the shallowness made Oleanna pull forward as she would in a lock. No matter what I did with the throttle and tiller she wasn’t going to be allowed to do what I wanted, so I had to enlist the girlie button to assist. Of course at the next lock the water level was such that it was flowing over the top gates! At Kibworth Top Lock we left the broad locks behind and headed for Oleanna’s first tunnel. 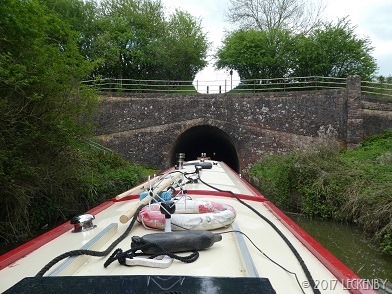 Saddington Tunnel is good and straight and 880yards long, you can easily see the other end. it is two way traffic, but no-one was coming. With tunnel mode engaged our passage was easy, our tunnel light was big and bright and pointed away from any possible on coming traffic. 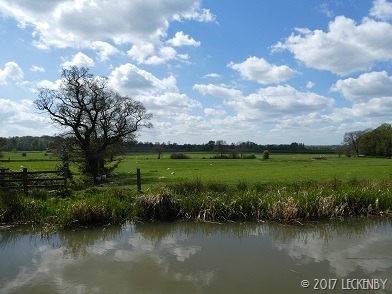 The canal does a few wiggles around bright green fields and then bends its way around Debdale Marina. A walker told us that a boat was coming out of the marina and so it was, all 70 or so feet. They were trying to turn towards Leicester and it was taking some doing, so we were allowed to pass once they’d reversed back into the entrance. Just a short distance on and the moorings before Rainbow Bridge came into sight so we pulled up behind a familiar, yet not correct sight. We know of NB Captain Hastings as it’s owner often makes comments on a facebook group we are in. Just a shame we didn’t have our yellow Lillian to moor behind him. Today Oleanna has had a couple of comments. First the Lockie was admiring her colouring, we did suggest he might like to buy Lillian off us, but his offer of £10 maybe £20 wasn’t really upto it. 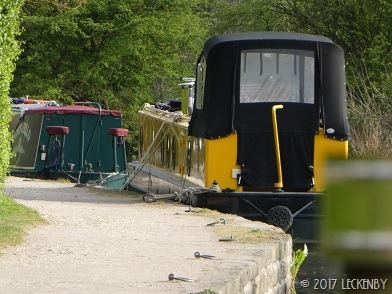 Then this evening a couple of girls have been walking up and down the towpath looking at boats. The taller of the two decided that Oceanna was the one she liked the best. “I’m ‘avin’ this one!” at the top of her voice right outside our galley window. Well she can’t because firstly she can’t read and secondly she is ours! 12 locks, 9.68 miles, 1 tunnel, 0 mysterons, 0 newspaper! 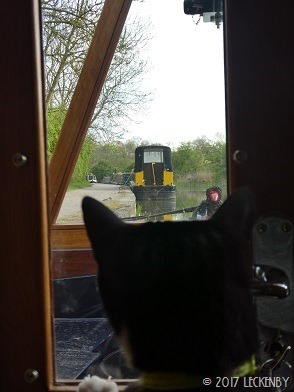 2 low pounds, 1 even lower, 2 Lockies, 1 wonderful lunch mooring, 1 yellow boat, 1 bewildered cat, 3 paws will have to do! 1 cat feeling sorry for herself. This entry was posted in Uncategorized on 22nd Apr 2017 by pipandmick. We (nbalchemy.blogspot.co.uk) had a similar experience a couple of weeks ago regarding the water running, although we were coming in the opposite direction. 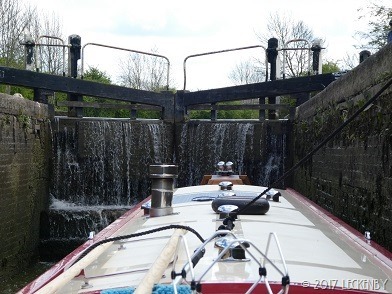 We had an interesting chat with one of the lockies and his claim was that it was all because their locks (their region ends at Kilby Bridge – after that another takes over) were worked on over the winter and now they do not leak very much – not enough to keep the pounds down below full! Hi MikeThe Lockie said pretty much the same to Mick. It does seem like they spend most of the day walking back and forth letting water down trying to sort levels.